Blogs about Graphic Design are an ideal source for staying up to date on the latest developments and learn new insights into all sorts of Graphic Design topics. A good Graphic Design blog offers in-depth analyses, how to guides, industry trends, handy statistics insights, strategy papers, the best tools for the Graphic Design professional and much more. The only problem is that there are a lot of Graphic Design blogs out there and they are all screaming for your attention. It is estimated that there are more than 440 million blogs worldwide, and about 2 million blog posts are written every day. Luckily, not all of them write about Graphic Design, but you get the idea right? So which Graphic Design blogs are successful in providing the information you need and how can you find them? You can do a google search and search for the Best Graphic Design Blogs, but then you get hundreds of “Best of Lists” in front of you, so that doesn’t help a lot either unless you want to spend a full day going through all those lists. Well, that is exactly what we did! We searched for 50 “Best of Lists” highlighting the most recommended Graphic Design Blogs, selected and combined the 16 most valuable “Best of Lists” and earmarked and ranked what Blogs about Graphic Design keep up appearing on most of those recently published lists. From a total of 183 Graphic Design Blogs compared, reviewed and ranked, here are the Top 20 Graphic Design Blogs around. As we are a small business ourselves, we use this list as well for educating and inspiring our minds and for optimizing our Consultants 500 platform, on which you can also find and search for Graphic Design Experts. If you are a Graphic Design Expert yourself, you can create a free profile on our Platform in a few minutes and without any credit card, opening doors to new opportunities. Listed 6 out of 16 times. Founded in September 2006 in Germany, Smashing Magazine delivers reliable, useful, but most importantly practical articles to web designers and developers. Through their articles, digital books, job openings, conferences and membership, they are committed to nourishing productivity, improving design and development skills and finessing the work-life balance. Listed 6 out of 16 times. Logo Design Love is a website and book devoted to logos and visual identities. Launched in 2008, the site’s regularly updated with good ideas and identity-related features. It is a hybrid website and design book set out to help artists generate ideas on how to design logos and strengthen their own brand identities. Also, the blog encourages the design communities to get in touch with them. Listed 3 out of 16 times. The Dieline is the world’s most visited packaging design website, and it highlights the importance and value of packaging design for brands in today’s world. By creating a platform where the community can examine projects, learn more about the design process, and stay informed of trends, it encourages designers and brands alike to question their own work and hold themselves to the highest standards possible. Listed 3 out of 16 times. Creative Bloq delivers a daily mix of advice and inspiration for digital and traditional artists, web designers, graphic designers, 3D and VFX artists, illustrators, and more. They bring the very best creative work to the audience and offer the insight that enables them to keep up to date with the latest trends and developments in global design and to create their best work. Listed 3 out of 16 times. Canva’s blog is one of the best graphic design blogs for readers who wish to level up their skill set and learn more about the craft. The blog is called “Design School” because it provides so much information about marketing and blogging tips, templates, and good old-fashioned inspiration. Listed 4 out of 16 times. David Airey is a graphic designer and writer in Northern Ireland. He runs a multitude of great design related blogs, including his personal design blog on DavidAirey.com. David’s style of writing engages his readers as he shares his thoughts on a variety of design related subjects, from logo design and the business of graphic design through to the world’s best swimming pools. Listed 3 out of 16 times. I Love Typography, is the blog devoted to fonts, typefaces and all things typographical. It is the online home for lovers of lettering, type design, and typography. The blog was created to make the study of typography more accessible to everyday people, and in the process, it became a major source of inspiration for designers all over the world. Listed 4 out of 16 times. You The Designer is a graphic design blog that strives to be on the cutting edge of design news, tips, trends, tutorials, resources, and much more. It has features that give more emphasis on the artistic qualities of designers rather than only looking at their technical skills. Listed 3 out of 16 times. The Speckyboy website was launched with the intent of serving as an inspirational hub for web designers. As web design trends became more advanced and more tools became available to fuel designers’ efforts, things changed dramatically for Speckyboy and evolved into the web design magazine you see before you today. Listed 5 out of 16 times. Abduzeedo is a collective of individual writers sharing articles about architecture, design, photography and UX. It was founded by Fabio Sasso in 2006 as a personal blog, later growing to become a digital publication with several writers from all over the world, working independently. From different styles to mediums, ABDZ has evolved with the industry and became one of the most sought after design blogs on the web. Listed 3 out of 16 times. Creative Review has been bringing the creative community together since 1980, first as a print magazine and now across more platforms than ever. They deliver the sharpest opinion, analysis, and advice on life in the creative industries, with a focus on insight, leadership, process and inspiration. Listed 3 out of 16 times. JUST Creative is graphic design portfolio & blog of Jacob Cass, a freelance designer in New York specializing in logo, web & brand identity. On this website you will find his personal graphic design portfolio, as well as a blog on the main subject of graphic design which provides free graphic design tips, articles & resources on all subjects of design, ranging from but not limited to: print design, logo design, web design, branding, typography, advertising & more. Listed 3 out of 16 times. Launched in 2005, the blog has been around for more than a decade. It features ideas and tips on how to design applications, and a huge collection of designs, including abstract, classic, data organization, minimalist, modern, photography, and typography. Listed 4 out of 16 times. For the best part of a decade, WebdesignerDepot has been at the heart of the web design industry, and it is far more than a blog: With more than 1.1 million newsletter subscribers, and over 740 thousand Twitter followers, they’re a community. Their writers deliver the best insights on design, user experience, and freelancing, because they’re real designers, working with real clients, bringing real world experience to your inbox every morning. Listed 4 out of 16 times. Brand New is a division of UnderConsideration, chronicling and providing opinions on corporate and brand identity work. They cover redesigns and new designs of notable products, companies, services, and organizations across all industries and locations. Brand New is edited and written by Armin Vit, co-founder of UnderConsideration. Listed 4 out of 16 times. SpoonGraphics posts three main types of content: Tutorials to show you how to create awesome designs; Freebies to use in your own artwork; and Articles to share theory and inspiration from various creative genres. Every week you’ll find a new post that falls into one of these categories, alongside periodic updates letting you know about cool deals and site news. Listed 3 out of 16 times. Codrops is a web design and development blog that publishes articles and tutorials about the latest web trends, techniques, and new possibilities. The team of Codrops is dedicated to provide useful, inspiring and innovative content that is free of charge. Listed 4 out of 16 times. Eye Magazine, the international review of graphic design, is a quarterly print magazine on graphic design and visual culture. It, and its associated blog, features a range of critical, informed writing about design and visual culture. There’s much on design history to be had too. Listed 3 out of 16 times. Dexigner is the leading online portal for designers, architects, illustrators, engineers, artists, and creatives of all kinds. Founded in 2001, Dexigner publishes the latest design news, events, competitions, books and resources. Listed 3 out of 16 times. Designmodo provides articles, tutorials and industry news about trends and techniques. The website is visited by professionals from small- to large-sized companies and is used as a reference by many design and coding schools. Guides to Graphic design can offer a great overview of what Graphic Design is all about. So here are a few highly popular guides established by some of the Graphic Design authorities around. In this article, I’ll focus on the main principles, heuristics and approaches that will help you to create a great user experience for your website. I’ll start with global things like the user journey (how to define the “skeleton” of the website) and work down to the individual page (what should be considered during web page design). We’ll also cover other essential aspects of design, such as mobile considerations and testing. A collection of identity styles guides from around the world as published by Logo Design Love. The 20 Design Rules You Should Never Break as published by Canva. From typography to layout, right through to color and special effects, this list runs through a few basic rules, tips, tricks, and guides to some common errors and how to banish them from your design. Web Design Books offer a great way of learning and at a much lower price than taking, for example, a specialist Web Design course. We wanted to know what the best Web Design Books around are so we did some research. Don’t Make Me Think: A Common Sense Approach to Web Usability by Steve Krug. HTML and CSS: Design and Build Websites by Jon Duckett. Responsive Web Design (Brief Books for People Who Make Websites) by Ethan Marcotte. UXPin – Our first choice, UXPin, is a wireframing and prototyping tool that has been designed to not be limited to just one thing. To fully appreciate a tool like UXPin, it’s important to understand the context in which it exists. With the digital revolution rapidly changing the way we interact with the world around us, there has never been a greater demand for well-designed products – both aesthetically and functionally. It’s precisely for this reason that UXPin’s integrative and collaborative approach to building products stands out. UXPin describes itself as a collaborative platform for increasing the speed, quality, and scalability of product creation and that’s exactly how it feels to use the platform. Sketch – Sketch is a vector design tool entirely focused on user interface design. It’s easy to pick up and costs a fraction of the price of Photoshop. Because of its simplicity, anyone with little to no training can learn Sketch. This tool has gained a massive following since it launched in 2009. The speed at which Bohemian Coding (the creator of Sketch) is moving is very impressive – the team has already introduced improved exporting, symbols and simplified vector modes. Sketch uses a single unit, styles only relevant to UI design, a built-in iPhone previewing tool called Mirror and Artboards, the most efficient way to design multiple screens. Photoshop – Photoshop was created in 1988, and since then, it has become the de facto industry standard in raster graphics editing, such that the word “photoshop” has become a verb as in “to Photoshop an image”. This photo-editing software has come a long way from its roots of making fashion models look even skinnier. For use as a web design tool, Photoshop offers a grid system, Smart Objects, and vector images (Vector Smart Objects). These features complement its popular photo-editing capabilities: color options, photo enhancement, and pen tool options give it an artistic advantage. Affinity Designer – Affinity is an application by Serif that gives you the most amazing alternative to any designing tools. If you have just started web designing or are looking to switch applications or design tools then Affinity is the one for you. The designing tools and process of this particular app are quite familiar with professional tools to help you professionally design your work and create amazing, unique prototypes for any iOS or Android device. This Mac-based design software offers exclusive features to stand out against Photoshop’s deficits: Affinity Designer’s 1,000,000% zoom dwarfs Photoshop’s 32,000%, its interface is designed to be a more efficient layout than its competitors. Avocode – Avocode is a program which is purpose built for the process of going from PSD (or Sketch) to code. It doesn’t automatically generate sites for you, rather it gives you a set of tools which enable you to create sites in the way you personally prefer, aiming to bridge the gap between the design and coding stages of web development. Therefore, if you are a front-end developer who is looking for an easier way to get your work over to your back-end coders, Avocode could be just what you need. The collaborative nature of Avocode means that all of the work takes place in a central location. Sass – This tool takes the first place, as it is the most reliable, mature, and professionally-robust CSS extension language across the web. SASS is an extension language for CSS which brings a number of features allowing you to write more maintainable code. The import feature allows you to separate your CSS into smaller, more manageable files without the HTTP request overhead. The tool helps you extend the functionality of an existing CSS of your site, such as variables, inheritance, nesting, and mixins with ease. Since Sass is compatible with all CSS versions, you don’t need to take stress while creating a beautiful website or web app – use any available CSS library as per your requirement. Bootstrap – Bootstrap is one of the most popularCSS3, and JS frameworks and the foundation of many sophisticated websites. It is ideal for projects of all sizes. The tool simply optimizes your website and app with a single code base, from desktops to tablets to smartphones with CSS media queries to help you run a responsive and mobile-first site. Apart from this, you will get comprehensive and intriguing documentation for common HTML components, custom HTML and CSS elements, and top-notch jQuery plugins. Sublime Text – This is the best IDE for PHP development, a text editor for code, markup, and prose. Sublime Text provides you with a very simple, yet sophisticated, text editor that focuses on making the writing experience easy, smooth, and controllable. It is available for OS X, Windows, and Linux. One license is all you need to use Sublime Text on every computer you own, no matter what operating system it uses. This tool uses a custom UI toolkit, optimized for speed and beauty while taking advantage of native functionality on each platform. Foundation 5 – Foundation is a family of responsive front-end frameworks that are supposed to ease the development of responsive websites, apps, and emails. It’s fast and practical to use, providing a responsive grid system, with neat HTML and CSS components, and lots of templates (including some useful bits of pre-written code). It is a perfect tool for designing a top-notch website or web app – all thanks to its advanced features that can help you quickly prototype, customize and extend to get your projects polished and delivered to their potential clients. Besides reading blogs about Graphic Design, there are other great ways to stay up to date with the latest Graphic Design trends and developments. Via our Web Development Community Forum, Professionals and Clients can share knowledge by having Q&A conversations about typical business issues or best practices related to Web Development. Here you can share your Web Development Knowledge, rank answers by how valuable they are, or just read and follow any Web Development topic you want, and get noticed when new contributions are made to discussions you follow. Via our Web Development Briefing Room, the Top Web Development and Design resources on the web are followed, which includes the Top 3 Graphic Design Blogs listed above, and only the most shared content is shown. You can filter all the content for the last 24 hours, 3 days, 1 week, 1 month, 3 months, etc so you can easily find and stay up to date with the latest Web Development trends. Join the Q&A conversation about What Are Your Favorite Graphic Design Resources? Later on, we will share the results via Knowledge Resources, so you can quickly find the best Graphic Design Resources on the web as suggested by our users and visitors. More than 75% of potential Clients who look for Web / Graphic Design Services start a Web Search to find the best Web / Graphic Design Specialist for the Job. Because the internet is by far the leading channel, it is critical that your business can be easily found on the internet. Creating a profile on our Platform is free and opens the door to new opportunities, it can be done in only a few minutes and without any credit card. Easily find and compare highly qualified Web / Graphic Design Experts by searching our Platform, which can be Web Design Firms, Web Design Experts or Web Design Freelancers. Directly contact and work with your ideal candidate in any way you like. Searching is always free, and that also means that we never charge any transaction type of fees. We made a list of 50 posts that we recently published about “Best Graphic Design Blogs” to follow. From this list of 50 posts, we selected the top 16 that seem most valuable to our readers and users. 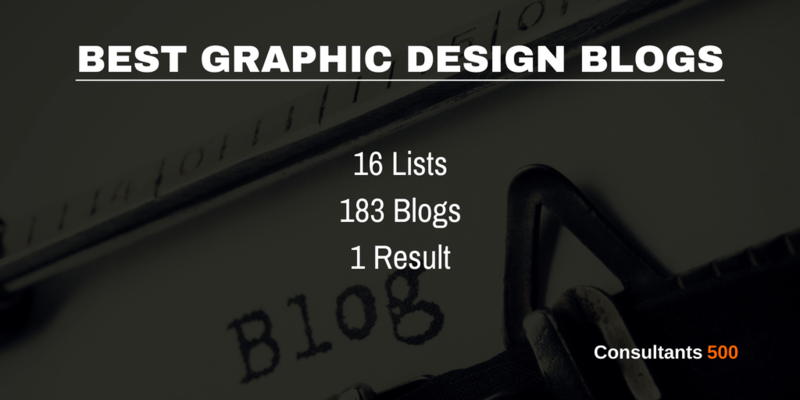 We combined the 16 lists of “Best Graphic Design Blogs” and earmarked all individual blogs that were on those lists. When a blog was ranked as number 1, it got 1 point, and when it was ranked 2nd, it got 2 points, etc. When no particular ranking was applied to a certain list, then each listed blog got the same points. To be included in the final list a blog should be listed for a minimal number of times. More weight was assigned to blogs which were explicitly listed more times than other books. All lists were summed up, and the Graphic Design Blogs with the lowest number was ranked 1, 2, 3, etc. This resulted in the final “The 20 Best Graphic Design Blogs” that have been recommended most times by all types of Graphic Design experts.